In this video, I build a 3D Printed Desk lamp. 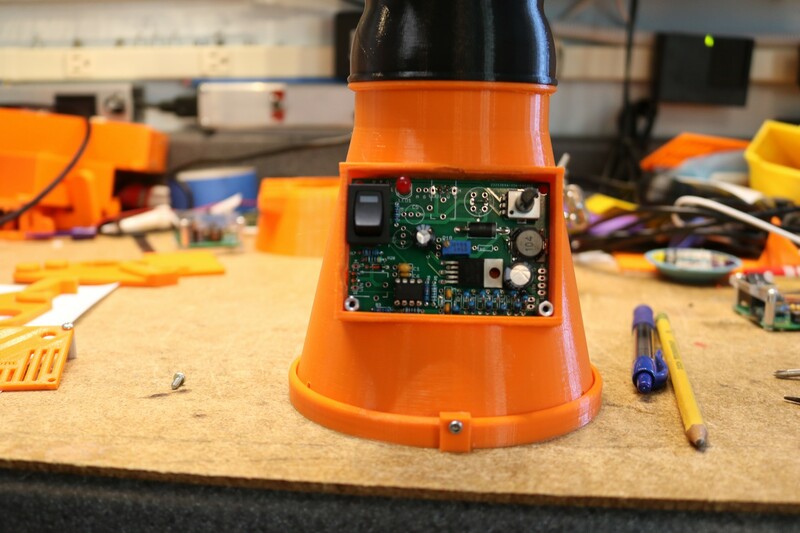 The basic design came from Thingiverse, but I repurposed my LM2576 Constant-Current design to serve as a dimmer. 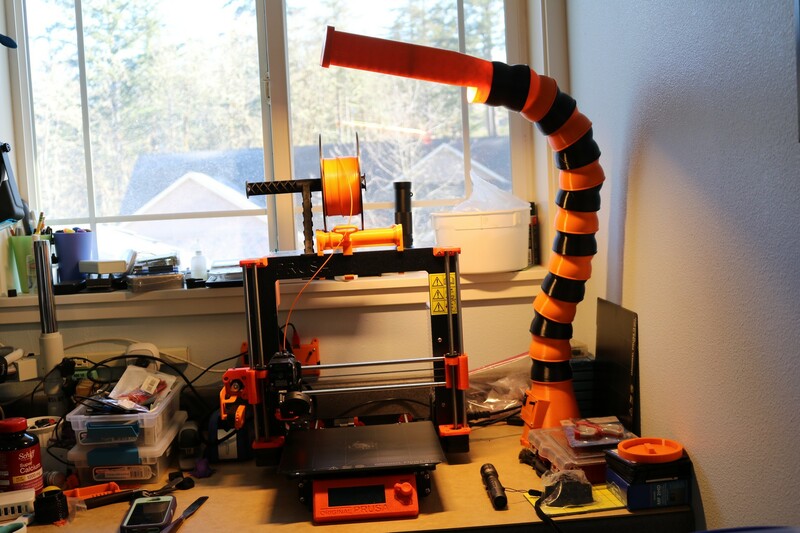 It all started when I found an interesting lamp on thingiverse, https://www.thingiverse.com/thing:3328807, which used used 75mm air hose segments from another model, https://www.thingiverse.com/thing:3283786/, to make a flexible articulating desk lamp. What appealed to me about this project is the size of it, and the use of COB LED panels, which I’ve been wanting to experiment with. 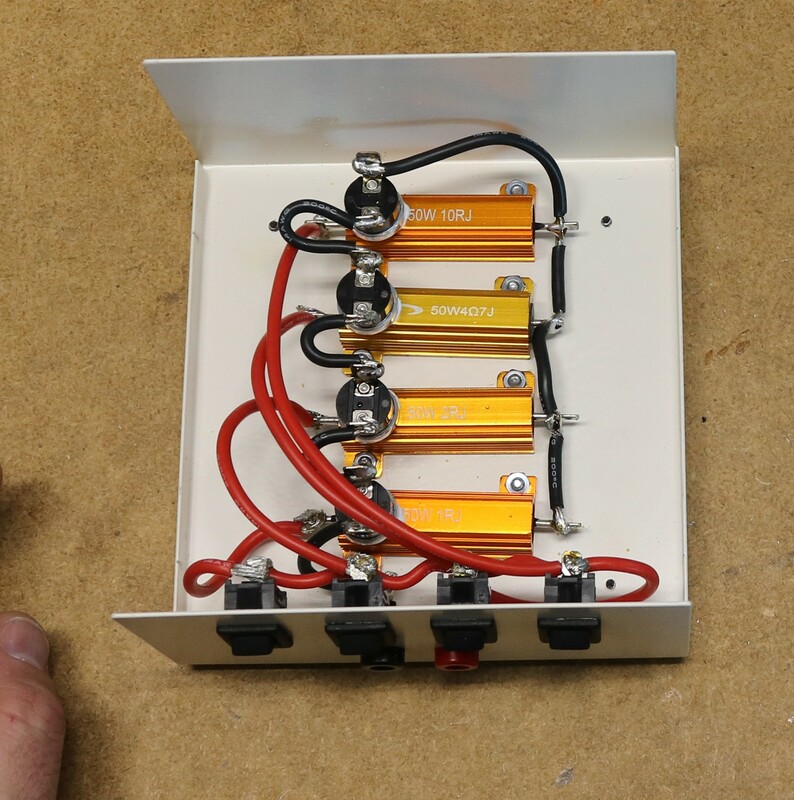 BigCliveDotCom had a nice video on the COB panels, https://www.youtube.com/watch?v=9F-WUcJlgko, that explained how to drive them and the appropriate voltages and currents. I knew immediately that I wanted to drive these COB LEDs with my LM2576 Constant Current voltage regulator, originally described in another blog post, http://www.smbaker.com/lm2576-constant-voltage-constant-current-switching-power-supply. I’ve been planning on building a resistive load for a while. I already have an active load, based on a design presented in an EEVBLOG post, that used an opamp and a mosfet to provide an adjustable DC load. However, I’ve often noted that I see occasional oscillations when using the active load on my power supply projects. Are these oscillations ripple in the power supply? or are they an artifact of the current-sense/op-amp/mosfet loop in the DC load? 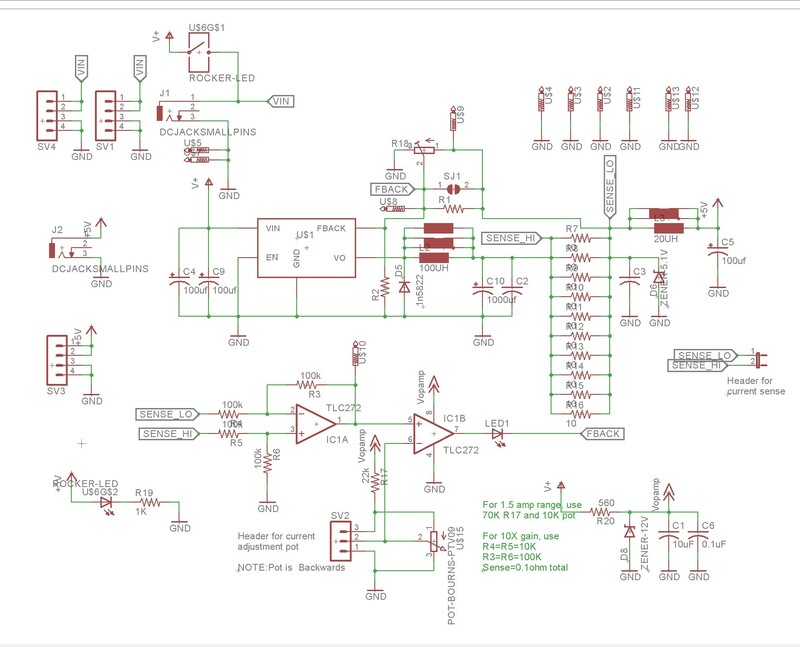 One way to figure this out would be to build a different kind of load, a completely passive resistor based load. I started by buying a pile of 50 watt metal-encased resistors on eBay. Just search for “US Stock 4pcs 1 ohm 1 50W Watt Aluminum Housed Metal Case Wirewound Resistors” on eBay and you ought to stumble onto the same buyer I did, or similar. I purchased 1 ohm, 2 ohm, 4.7 ohm, and 10 ohm resistors. Now that the load was finished, I was ready to move on to building the power supply / dimmer. * Added some extra inductor footprints as the inductor I was using was undersized for working in the range of a couple amps. * Added an onboard potentiometer for setting the current limit. 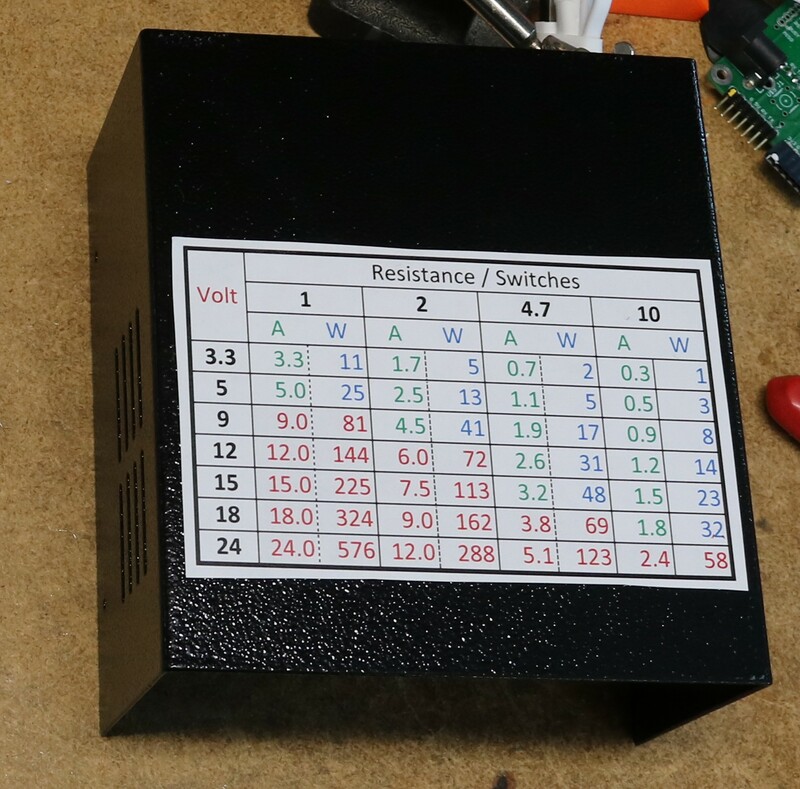 Note that I’ve chosen resistors to give myself approximately a 1.4A range,under the assumption that I want to max out at two COB panels at 8 watts each. In reality you probably don’t want to run the COB panels that hot, but I went for having a little bit of extra range. This meant using a 10K pot together with a 75K resistor for R17. I would have gone for 70K to give myself a little more range, but 75K was as close as I had. Testing the board out with a 1 ohm sense resistor (ten 10 ohm resistors in parallel) got hot. About 250 degrees hot, with almost two watts of wasted power. I decided now was the time to see if I could safely use a smaller sense resistor. 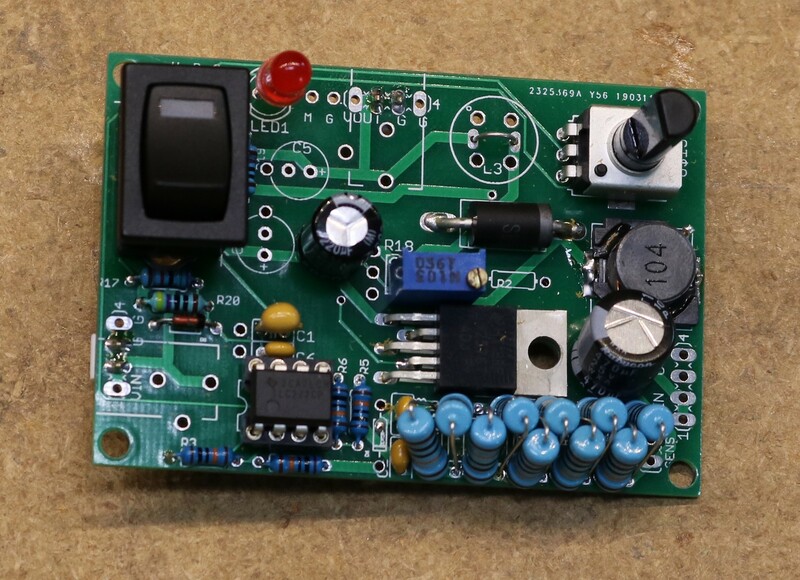 This was easy enough, I made a second board, instead using ten 1 ohm resistors, for an overall sense resistance of 0.1 ohm. Then I upped the gain on the op-amp from 1X to 10X. The circuit behaved exactly was before, with the exception of slightly more ripple while the constant current mode is engaged. 0.440 volts peak-to-peak instead of 0.380 volts peak-to-peak. That’s a tradeoff I can accept, to reduce energy waste and heat generation. The schematic above documents the component substitution necessary to make the change. * There is no current limiting in the panel, you need to limit the current (or the voltage) yourself. * The panels are really cheap, under 2 bucks each. * They’re typically described on eBay as “10W 12V COB LED Panel Rectangle Strip Car COB Chip Light Panel Lamp 1000LM” or such. * Although they have a nice think aluminum panel behind them, they will throw off a lot of heat. I recommend derating them a bit and running them less than 10 watts. I figure around 8 watts to be a safe derated limit though in practice I tend to run them less than that. 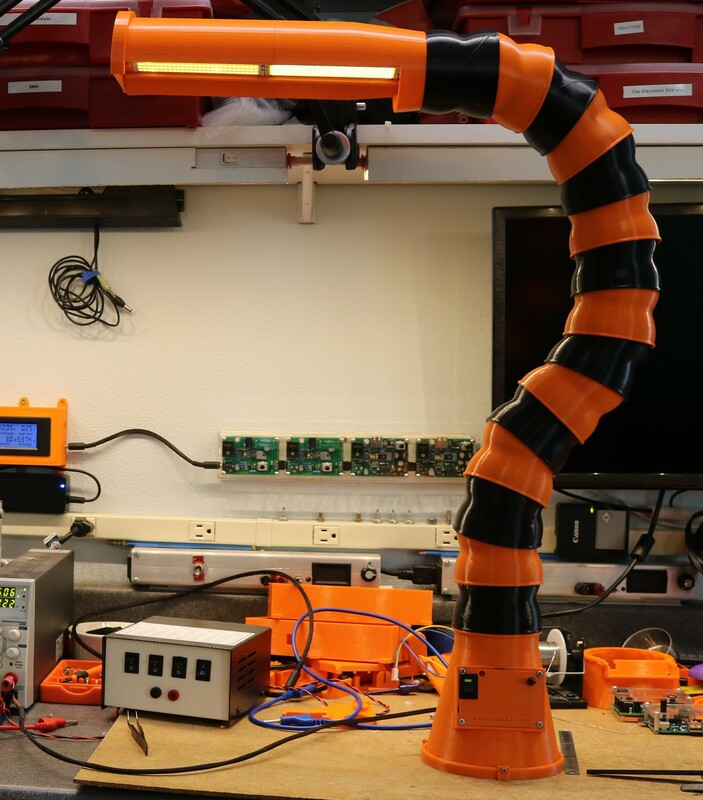 * I printed my lamp in PETG for some degree of temperature resistance. So far I haven’t melted the lamp yet. So far. 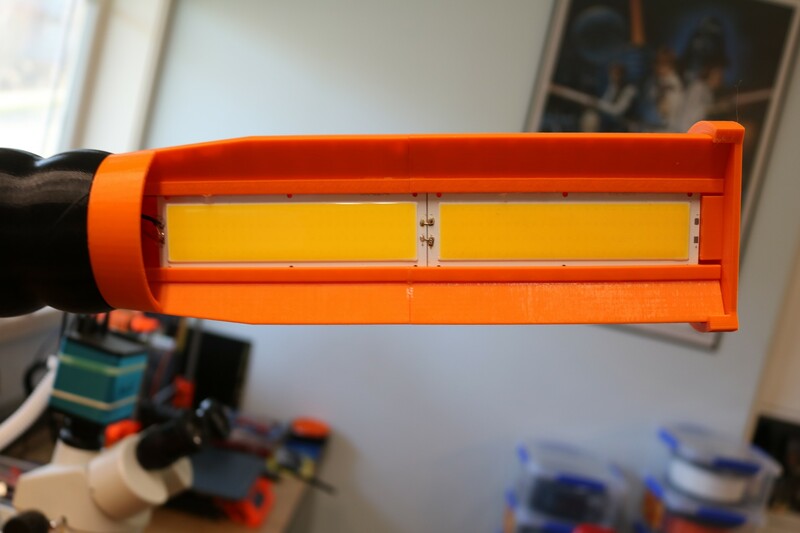 My remix of the lamp is at https://www.thingiverse.com/thing:3498571, and includes changes to the fixture so it prints in two pieces, changes to the base to incorporate the constant-current power supply, and changes to the baseplate so it can be attached with machine screws.